Crossroads can be quite tricky to cycle through as traffic is could be coming from three different directions at the same time and you may have the added pressure of cars behind you being impatient for you to move. If necessary, give a clear left hand signal. If you are approaching a solid white STOP line you must stop to check for traffic. If you are approaching a give way line, slow down, and if you have a good clear view of the road as you approach, you may make the turn if safe. If there is traffic coming you must stop. Set your pedal. When safe, turn left and take up the primary riding position until it is safe and then return to the secondary riding position. Be very careful if you have traffic wanting to turn right from the road ahead of you, you have the right to turn before them, but make sure they are clear about what you are going to do. Well before the junction check back and when safe move to the primary riding position to block the lane. Slow down and come to a stop if approaching a solid white STOP line. If approaching a give way line, it is not always necessary to stop if you can see the road is clear. Keep a good look out for any traffic turning into your road that may be cutting the corner. Ride across the road and continue in the primary riding position until it is safe to move to the secondary position. Remember there is no signal to show others you want to go straight ahead. Taking up the primary position will help others know that this is what you want to do. If there is traffic on the opposite side of the road preparing to turn right, be very careful as they may turn in front of you. 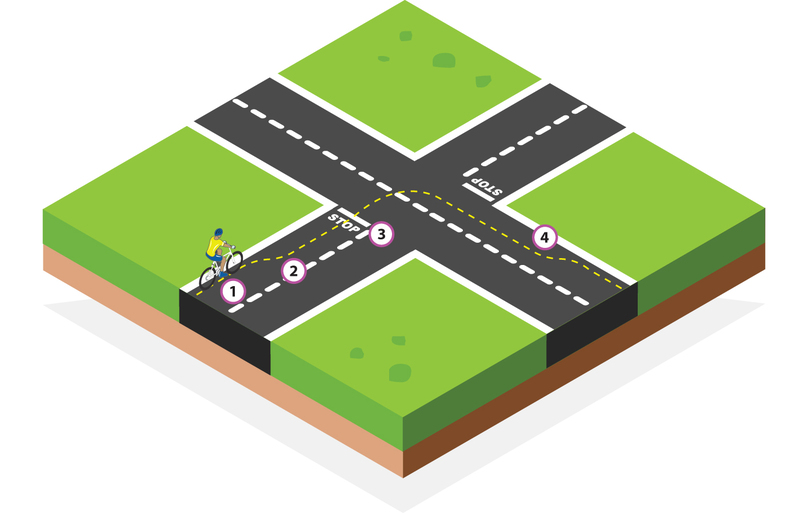 Only attempt this turn at very quiet crossroads or where there is a set of traffic lights to help you, as this can be very tricky even for experienced cyclists. Not only do you have to check for traffic from the sides but work out what traffic ahead of you might do. If this traffic intends to go straight ahead or turn right in front of you, this can place you in great danger. If necessary, give a clear right hand signal. If you are approaching a solid white STOP line you must stop to check for traffic. If you are approaching a give way line, slow down, and if you have a good clear view of the road as you approach, you may make the turn if safe. If there is traffic coming you must stop. Set your pedal. If there is traffic ahead of you, it may be a good idea to signal your intentions again so they are clear about what you want to do. When safe, turn right and take up the primary riding position until it is safe and then return to the secondary riding position.